View Building for performance and resilience on Notist. BUILDING FOR PERFORMANCE AND RESILIENCE The case for fast loading websites has been made. We can point to case studies from companies like Amazon, Google, and Yahoo, linking page speed to increased revenue and profit (although it never hurts to remind ourselves!). Businesses understand this, and orders are coming from the top of the organization to speed up the site. So now we've decided to prioritize performance, what should we actually do? What should we be measuring? How should we be measuring it? And where do we start improving things? 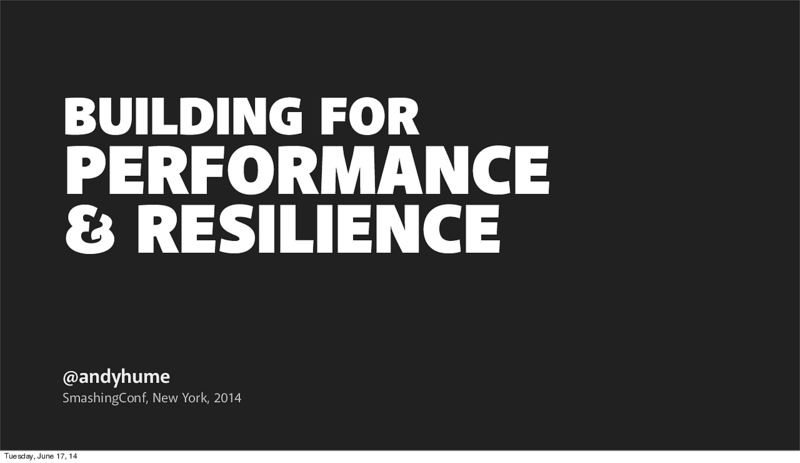 This talk will focus on architecting high performance, resilient front-ends. It will look end-to-end at how web pages get from a server to the screen on a user's device. It will cover how to prioritize and optimize that process, and look at tools for measuring and monitoring the right performance metrics over time, as well as other lessons from Andy's recent work on large scale sites like the Guardian and Twitter. Andy puts presentations on for free. You can too.